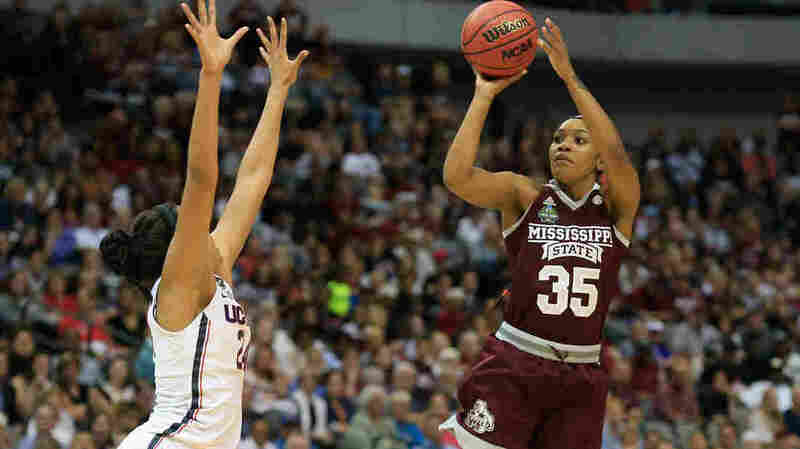 Mississippi State Drops Powerhouse UConn, Will Face South Carolina For Title : The Two-Way The University of Connecticut women came into the semifinal riding a 111-game winning streak, including a 60-point beating of Mississippi State in last year's tourney. Friday, that all was wiped away. 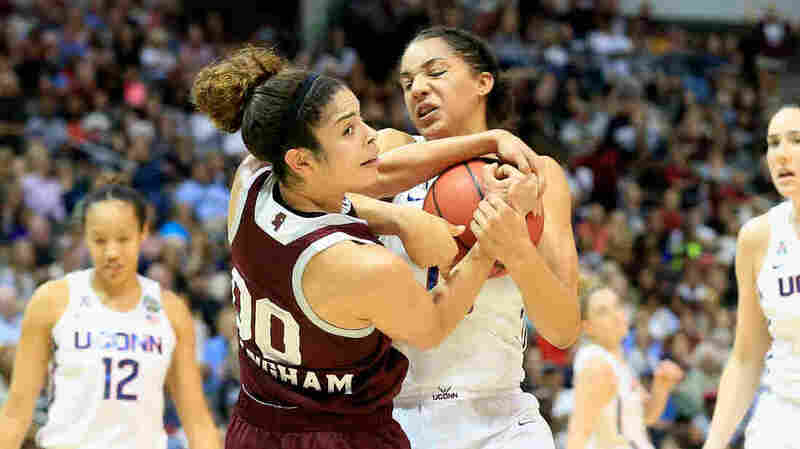 Gabby Williams of the Connecticut Huskies battles for the ball against Dominique Dillingham of the Mississippi State Lady Bulldogs in the first half Friday night during the semifinal round of the 2017 NCAA Women's Final Four in Dallas. Before Friday night's national semifinal game, the Mississippi State women's basketball coach gave an unusual motivational speech. "I will not be scared," Vic Schaefer told his players. "There is no reason to be scared. You are one heck of a basketball team." The tactic makes more sense in light of the opponent: 36-0 University of Connecticut, riding a 111-game winning streak that included a 60-point thrashing of Mississippi State in last year's Sweet 16. At the time, it was the worst defeat in tournament history. On Friday night, Mississippi wiped all that away, prevailing 66-64 on Morgan William's overtime buzzer-beater. Connecticut hadn't lost since Nov. 17, 2014. The Lady Bulldogs came right at the Huskies from the start, doubling up Connecticut 27-13 early in the second quarter and taking a 36-28 lead into halftime. That was just the second time all season, and the fourth time in the Huskies' lengthy winning streak, that the team had trailed at the half. 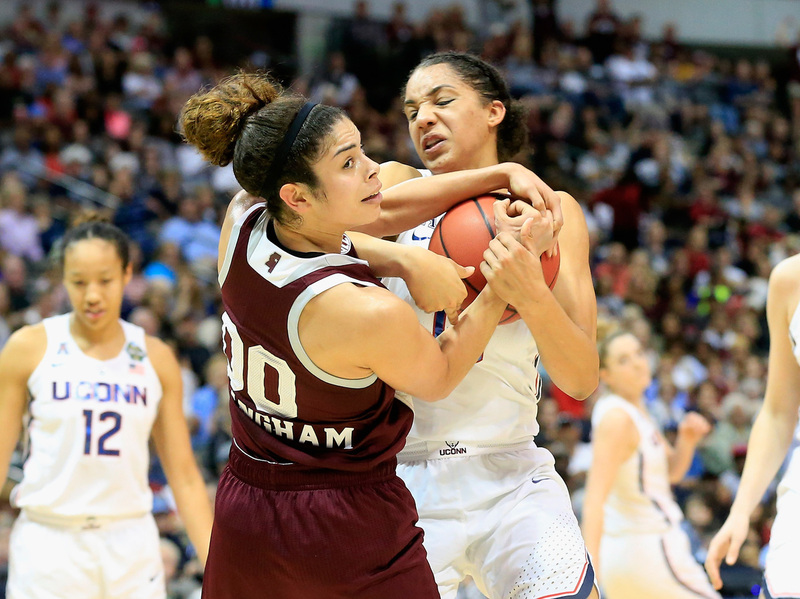 It was Connecticut that was playing scared, coach Geno Auriemma told his players at halftime, junior forward Gabby Williams said. Auriemma, making his 10th straight appearance in the Final Four, said earlier in the day that this year's team lacked killer instinct, KERA's Gus Contreras reported. "They haven't become what I hoped they would become — you know, like, edgy," he said. "They just have this attitude like, 'Everything will be fine, don't worry about it.' And yet they keep winning." Mississippi State leading scorer Victoria Vivians shoots against Napheesa Collier of Connecticut in Friday night's NCAA tournament semifinal. Connecticut recovered quickly after halftime, taking their first lead within three minutes. But that momentum dissipated, leading to a back-and-forth game the rest of the way and tie scores after the third and fourth quarters. 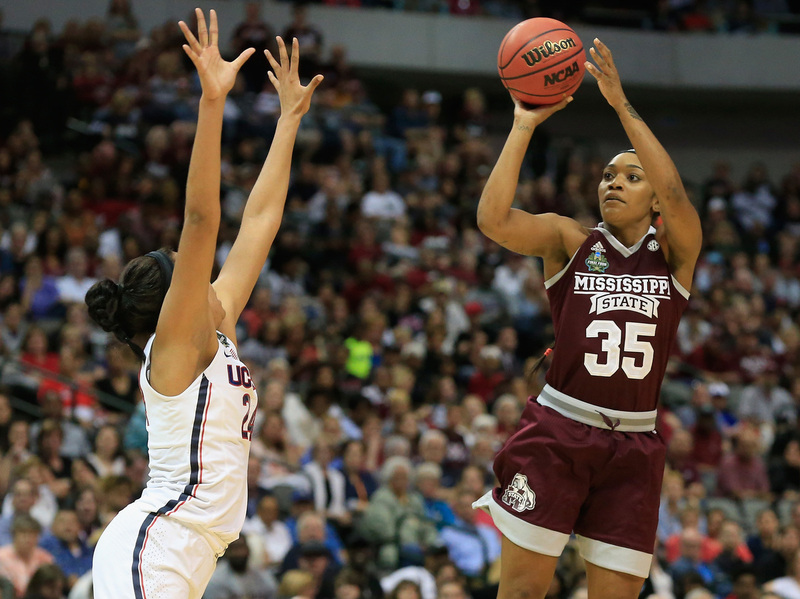 Mississippi State had a chance to win at the end of regulation, but Lady Bulldogs guard Morgan William passed up a wide-open three-pointer for a drive to the basket that was smothered by Connecticut's Gabby Williams. A flagrant foul with less than 30 seconds left in overtime let Connecticut tie the score and have a chance for the last shot, but a turnover gave William the second chance she needed. The 5-foot-5 William — hero for the second game in a row after scoring 41 against Baylor — ended the game with 13 points, six assists and three steals. Junior guard Victorian Vivians led the Lady Bulldogs with 19 points. Gabby Williams led Connecticut with 21 points on 7-12 shooting, as well as eight rebounds and four blocks. Sophomore guard Katie Lou Samuelson added 15 points and five rebounds. After the game Auriemma said the outcome didn't surprise him, and suggested the team might not have been mature enough for the intensity of the Final Four. "We talk about it all the time how hard it is to win in this environment," he said. "At this time of the year you start thinking about what's at stake. Maybe we just weren't ready for this." He said his message to the Huskies after the game was that "college basketball has given them a lot, you know? They've sent a lot of kids to the locker room over the years feeling the way they're feeling." 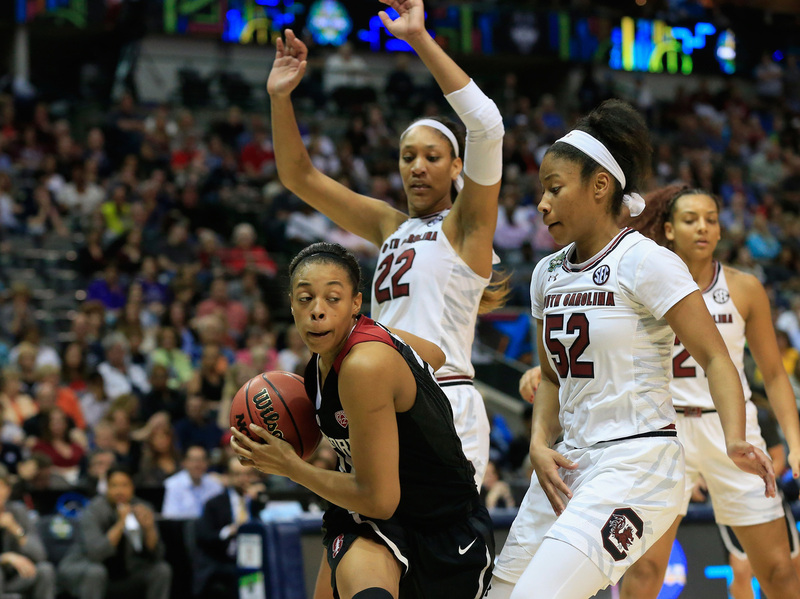 Erica McCall of the Stanford Cardinal drives against Tyasha Harris and A'ja Wilson of the South Carolina Gamecocks in the second half Friday during the semifinal round of the 2017 NCAA Women's Final Four in Dallas. In the first game of the night, South Carolina, a 1-seed, pulled away in the fourth quarter to avoid an upset against Stanford, a 2-seed, 62-53. It's the Gamecocks' first trip to the championship game. 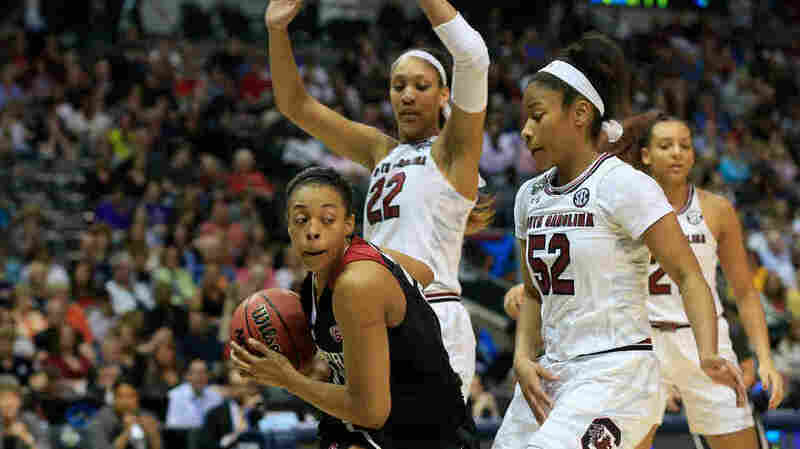 South Carolina was led by junior guard Allisha Gray, who scored 18 points on 7-14 shooting and had 8 rebounds. Junior forward A'ja Wilson, an Associated Press first-team All-American, added 19 rebounds and 13 points. Stanford's senior forward Erica McCall and sophomore forward Alanna Smith each scored 14 points and pulled down more than a dozen rebounds in the losing effort. "Staley said she could tell during halftime that her team would be fine.
" 'The looks in their faces weren't looks of defeat. It was looks of, "Ok, we're going to figure it out," ' she said. 'We couldn't play that sleep time basketball. We were allowing Stanford to put us to sleep, and we knew they were going to do that. We just had to get to halftime and make our adjustments. No matter how much we were down I felt like we were going to make a comeback.' "
Mississippi State and South Carolina, both members of the Southeastern Conference, played twice this year, with South Carolina winning both games by scores of 64-61 and 59-49. The title game will be 6 p.m. ET on Sunday in Dallas, and will air on ESPN.